Well, it's time to confess this. Enables light envelopes for area (shader) lights. This includes radiosity lights. Results in a much quicker -light compiles, but darkens all enveloped light sources considerably—this can be compensated for easily by raising your surfacelight values. Do not be confused by the "fast" nomenclature... -fast is perfectly suitable for "final" compiles. Creates a more realistic color ramp between "light" and "dark." Good values are in the 1.4-2.2 range. Games that use r_overBrightBits and r_mapOverBrightBits (Quake III: Arena, most notably) will need those cvars disabled unless -compensate is used accordingly. Scales back lightmap values to adjust for overbrighting when -gamma is used. 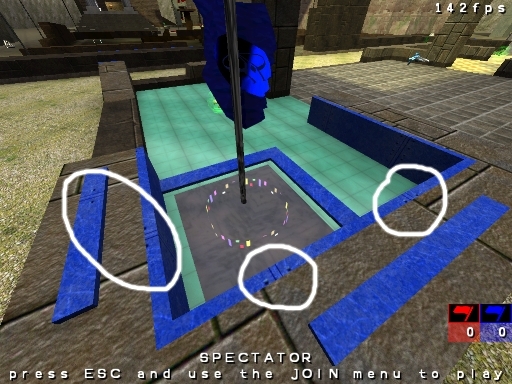 For Quake III: Arena, a good compensate value is 4, though some experimentation may be needed to find an aesthetic that suits your particular map. Scales up all sun/sky light sources by the prescribed factor. In this new era of -gamma -compensate, -sky 3 can allow "old style" sky shaders to be used without manually rewriting them. The one above may sound interesting for maps which come from Q3Radiant, maybe? Enables Q3Map2 radiosity, calculating radiosity light through N bounces. Allows bounced light to affect the lightgrid. Scales up radiosity lights by the prescribed factor. Some tries with these, too? "_q3map2_cmdline" "-meta -flares; -light -faster; -meta; -vis -saveprt; -light -fast -filter"
"_q3map2_cmdline" "-meta; -vis -saveprt; -light -fast -super 2 -filter -bounce 8"
Enables arbitrarily ordered grid supersampling of lightmaps. This is much, much, much slower than -samples, by the way. Applies a gaussian blur to lightmaps, smoothing out shadows. Sounds good in theory, but -filter doesn't play nice with a lot of the more interesting effects... don't use it. Use -samples instead. Note: "readme" files of some maps from Jan (inlcuded with OACMP zip and pk3) do mention some of the q3map2 switches he used. Such infos are now probably outdated. Maybe those lines should be removed by those readme files? "Happens also in best families", as we say in Italy. Well, nobody said that mapping is an easy thing. There are some switches which were left in q3map2, but -samples does the same as them but in a better way. That's why I don't use -filter anymore, for example. Also I do use -bounce. In fact, I use -bounce 8. Yes, the first options I checked on that wiki where those you mentioned in your post. But what dwould that additional "-bouncegrid" option do exactly? [OT] I notice you have not downloaded latest mappols pk3 yet. Just a reminder. By the way, maybe it would be better to split that quite long page into two distinct pages for compiling and packaging? Another thing: In ctf1 the sound is not loaded, it say "couldnt load OA03.ogg"
In central passages, looking up you can see another sort of texture that seems not choerent with the others. In lateral passages still missing source light and some ammobox. In CTF3 the red and blue light added from Neon_Knight emitt white light, it's a pouposed effect ? BTW, ctf1 has overlapping brushes in the caves. 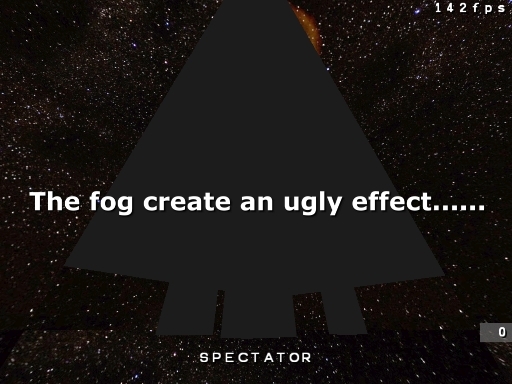 That's why you could see the effect. This will be solved as well. 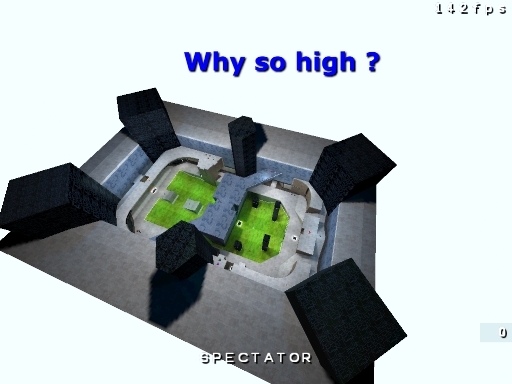 I don't remember the name of the map, but it's really necessary to go so high ? @Gig: Are you kidding me ? dm2 - I'll remove it. dm5 - That area shouldn't be reachable at all, indeed. dm8 - I'll see what can I do about that. dm10 - I'm not going to fix the map. That could be left to Gig, as I haven't touched his map at all. It's not a texture missing, it's a "brutal" graphic bug, i don't know why. Thats an old friend of mine! We had some battles, i reconstructed that portion a few times, but then out of nowhere it would reapear. 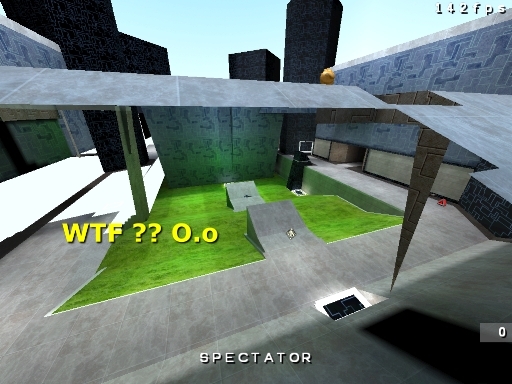 Anyway, this was literally my first map, i'll never make a map with so many slightly off angle walls ever again, eventhough i think it does add to its unique look. Anyways, it only happens to me when i change something in that general area...what did you do? 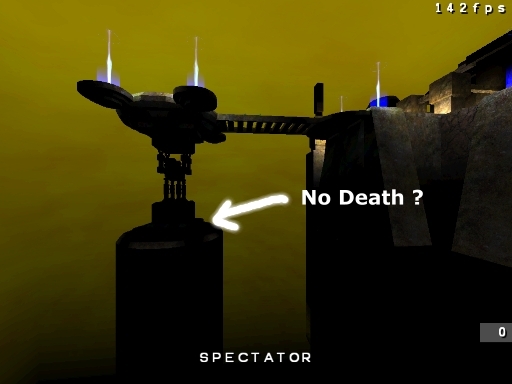 Yes, in CPMA style physics you could use the ramps and a double rocket to jump from one end of the map to the other, but you do need some headroom for that. Not present in the version i compiled. UPDATE: I did forgot to upload the second screenshot. Now it is attached. Yeah i saw that one, i must ask, why are we recompiling maps? I've documented how i compiled them which should enable anyone with a computer and internet access to compile them exactly like i did, so why not use the binaries i supplied? Or use the exact tooling and compiler options? Anyways, it only happens to me when i change something in that general area...what did you do? I do nothing, only spectate and roam in the map. It happen to Pelya too. It's the last version compiled by Neon_knight. 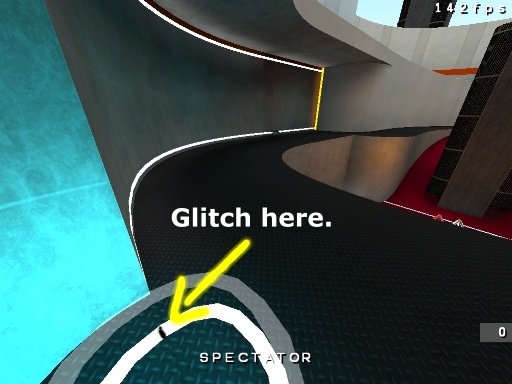 But in the version we have, there is the glitch, don't know what t tell you. Similar thing happens to me every time, when I update Android build. For the blue "bar" on the left, okay... I'm going to recompile the map, although I don't consider it a real issue (I'll have to scale up the texture on that face). About the other blue parts you pointed out, I will not modify them: that's just how that texture natually is, showing some "junction points": in case I would modify the top side of those brushes, they would not fit anymore with the lateral side. why are we recompiling maps? I've documented how i compiled them which should enable anyone with a computer and internet access to compile them exactly like i did, so why not use the binaries i supplied? It's part of the GPLv2 compliance. Or use the exact tooling and compiler options? Because not everyone will have them. A map should be compilable using any compile set. Under destruction version 19 is attached to this post (not a "standalone" package). - Moved 16 units down the light entities inside the scaffolding -in both ground floor and middle foor- (also slightly lowered the light value of two of them to compensate). The reason is just that I can guess it's more useful to illuminate the ground than the ceiling. This is just a minor change, that does not really fix the non-optimal lighting of that part of the map. But I had some fear making bigger changes at this moment. Note: files in the package still use "udestruction" name: they have to be renamed to "oacmpdm10" for the release. @Jan: in OACMPDM5, in your idea, the jumps from lateral platform to central platform should have been possible or not? (screenshot). It looks like they are possible/easy with 125 fps physics, but not with 90 fps or "accurate" physics. In OA original textures folder there is the "pulchr_simple" that have the blue and red color. Why don't you use them ? Textures like the one you have choose are to manage for prevent misalignement, by the way it's a minimal issue. I'm having difficulties updating the maps (none in the technical side, but RL is calling me -.-), but I'll do as much as I can. For tomorrow's final release, many "fixed" maps may have to be kept aside of the pack, so it's possible I'll be using v3 versions. Does anyone experienced pelya's ctf1 glitches too? Because I seem to have found the solution to those bugs, and it involves the use of the func_group entity. Does anyone experienced pelya's ctf1 glitches too? Excuse me, what do you mean exactly? By the way, I have no problem to postpone the V4 a few days, if you need some more. I think for OACMPDM4 you may just keep the original version, if you still have to work too much on it. For DM9, instead, a "fixed" version would be appreciated (ar at the limit, what about its very original version, directly from Akom?). Uhm... in theory I can guess I may have put a copy of them under baseq3 folder, to have them working in the editor. However, I also like those red and blue textures I used. And I suppose in this phase we should follow "don't fix what's not broken": I don't want to risk causing "damages" now. 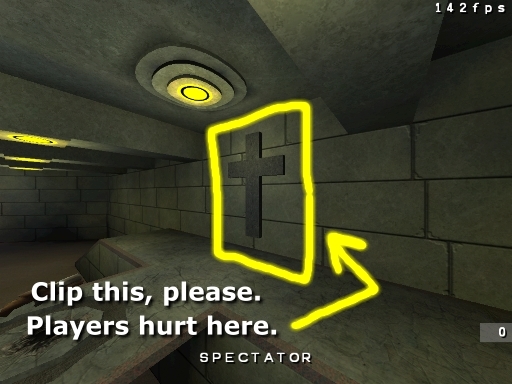 Maybe for the next map... 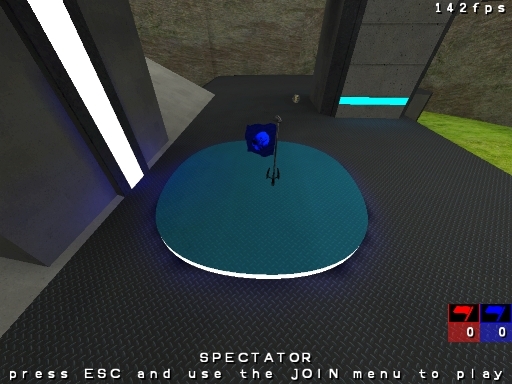 However probably my next map will be a "micro-tourney" one, where red and blue textures would have little use. Put one light with value 700 near a ceiling, and call it the sun That's what I did, before finding out how to make light-emitting sky. Neon_Knight, I don't know if you are going to release V4 today, or if you need some more days (I however propose a V4 beta2 before officially releasing V4). For me, there is no problem to wait for some more days. However, I just quickly looked at all the pages of this "v3 re-released" thread, to give a look to which posts did contain infos about known issues. I suggest you to give a look to them, to check out what's done and what's missing. However, if you want to scroll the whole thread yourself, you can do it... it's just five pages, so it's a relatively fast operation! - Keeping the v4-beta (not the fixpack) version, also adding Akom's suggested change to the cross area. - Keeping the v3 version but removing the fog. - Keeping the v3 version. - At this point I'll still keep the v3 version. - Changes regarding v3 version: fixings to the BSP hole area. Sparklies won't be fixed. - I'll try to fix those bugs, but I won't guarantee anything. - I'll try to raise the lighting. Again, I won't guarantee anything. And still waiting if the people wants me to bring back the old placement or keep the new one. - I'll keep the v3 version. - Sparklies won't be fixed. The MG ammo will be added. Overlapping brushes will be fixed, though. - Replace music so Gig won't complain as much. - The v3 version will be kept, with the extra of the botfix and quadfix. - Recompile with sky shaders. - Redo the bottom pit. - Redo the lighting at bases. - "Yellow dots" won't be fixed. - "Copying" without TXT won't be fixed. - Readmes will be done for dm8 and ctf2. - Mappools removed. Gig's mappools will be placed instead. - OACMP mod message fix.